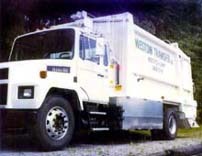 Welcome to the Harrison County Solid Waste Authority's web site! This site offers many resources concerning solid waste and recycling. Please browse our site for the latest information on events and more. Thanks for visiting. If you live in a municipality please go to our general information page to find out who to contact to have your household solid waste (trash) picked up and their schedule for trash pickup and recycling. Curious about those trucks? Click on the pictures for more information.